Last night my boyfriend was rearranging the bookshelves in his spare room. I picked up Arabian Nights and flipped through it briefly. I've always loved the beauty of Arabic culture. It is so exotic and every detail is crafted beautifully. It's a designer's dream to visit a heavily tiled expanse of a mosque with the vibrant jewel toned colors and curved architecture. When I was in Morocco, I marveled at the beauty of the countryside, the simplicity of the homes in mountains that were spiced up with colorful caftans, throw pillows, lights and tea glasses. I carefully carried back a Moroccan lantern that now sits beautifully on my coffee table. Another prized possession of mine is the little silver teapot that I brought back. 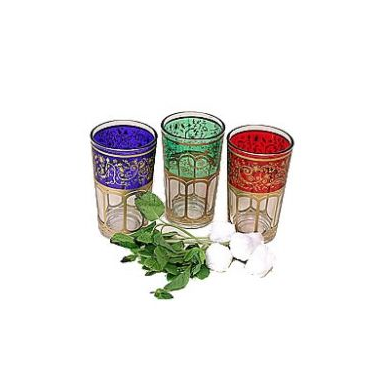 I regret not buying any adorable tea glasses like the ones above, which can be found at The Moroccan Bazaar. I reserve my special little teapot for Moroccan mint tea only. So every time I open it, I can smell the mint that has been inside countless times. I was taught this recipe at a little "henna party" we hosted at a home in Meknes. Even though it is warming up outside, try this hot tea for a sweet treat. Close your eyes and imagine a colorful souk in Fez! In a teapot, bring desired amount of water to a boil*. Add in a large handful of washed whole mint leaves, 4-6 tablespoons sugar and 2 teabags-worth of loose tea (don't keep the tea in the bag). Let it steep for 8-10 minutes. Pour into a glass and enjoy! Serves 2-4. *I boil my water in a separate teapot and put all the ingredients in my Moroccan teapot then add the water on top of it and let it steep. Or if you just have one teapot, let the water boil, add the ingredients and wait ten minutes to enjoy your beverage. Moroccan teapots have a little strainer in the spout that holds back some of the tea leaves. It is typical to have the tea leaves floating in the tea in Morocco and most countries. Just drink them down, it's a little extra flavor! If you really want to be Moroccan, serve the tea in a tea ceremony by pouring high above the glass, which aerates the tea, then pouring it back into the teapot for a little longer to really set in the flavor and continue aerating the tea. Pour out again from high up and lowering as the glass fills up.